Kombucha. I started to hear about it within the past year. One of our friends was drinking it to help his guts. Maybe even the hippie doctor (rather than the doc-in-the-box) told him to drink it. I don’t recall now how he got the idea. After this brief introduction several months ago kombucha slipped from my mind. 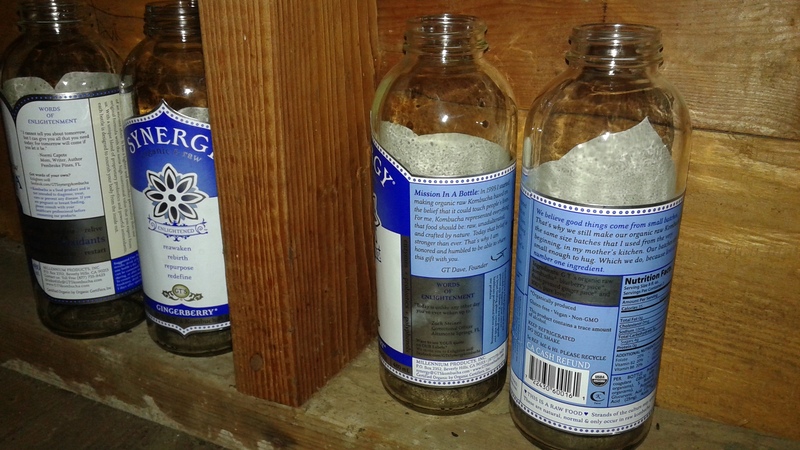 Kombucha returned when a friend from work was talking about drinking it. She said it had probiotics and explained that it was fermented tea. She briefly explained the brewing process: brew the sweet tea, let it cool, add some kombucha from your last batch, add the scoby, let it ferment for 7 days or so. Repeat. One day, she brought a sample of her kombucha. It was raspberry. It was a heavenly sweet (but not too sweet) vinegary raspberry tea. Toward the end of the night I said, “If no one else is going to drink the rest of that I’m going to drink it.” The sample was for all of us but some was left unclaimed. My friend recommended I go for it. She also offered to bring me a scoby. A scoby? OK. At the time I had no idea what a scoby was but if I needed it to brew kombucha I definitely would like to have one. When I got home that night I looked on the internet for brewing kombucha. 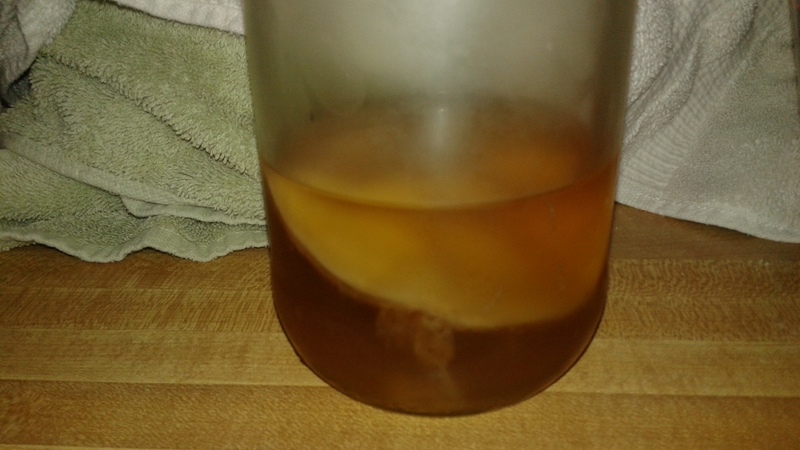 I learned what a scoby was: SCOBY (symbiotic culture of bacteria and yeast). 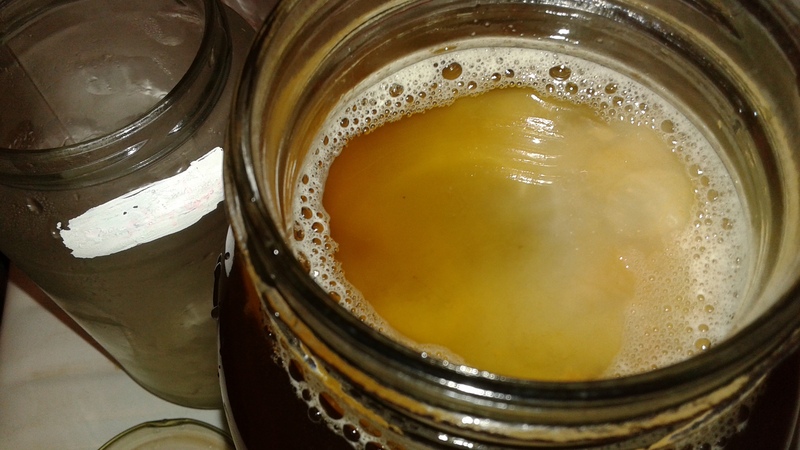 I read about how to make kombucha and how to grow your own scoby. Mine is a slow go on the counter right now so I am glad my friend did bring me a scoby a few weeks later. Also, it was fun to see people asking “What is THAT?” and pointing to a floating pancake mushroom-thing in a jar. 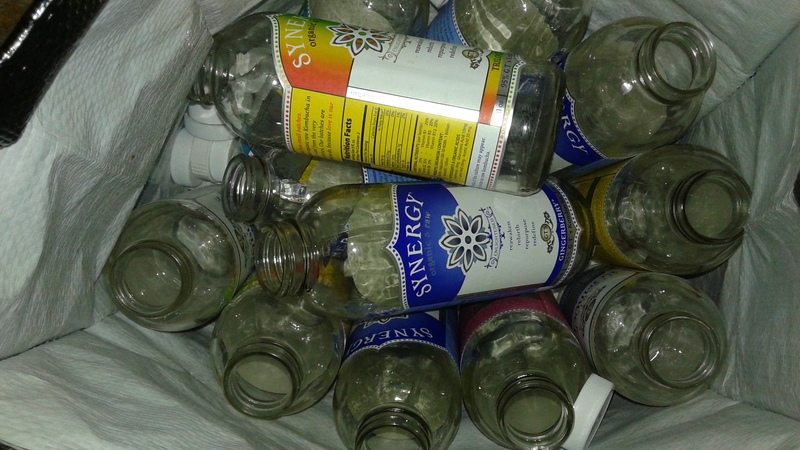 After that first encounter with kombucha I developed an obsession to get some and drink it. I found some at the local market and at the food co-op. I started stopping to get one nearly every day. I felt as though if I did not get a kombucha I would freak out. 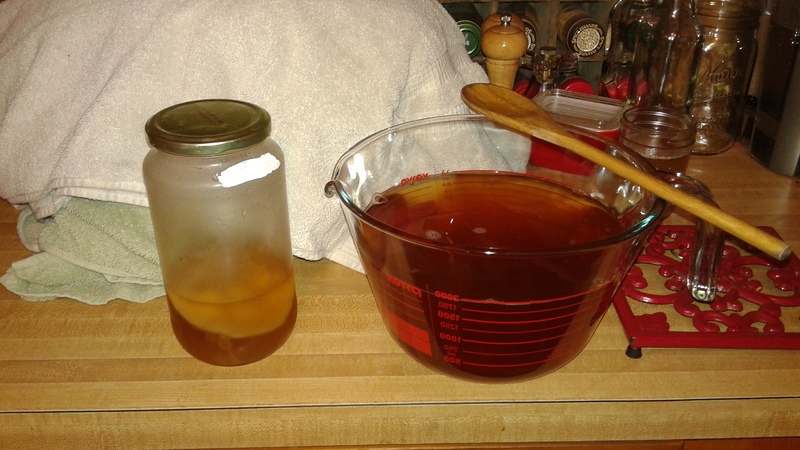 I was glad to receive a scoby and start making my own as it will be much more cost effective. Just the other day my first batch finished carbonating and I placed the bottles in the fridge. After waiting a while I drank some. It was tasty and fizzy, infused with raspberry. 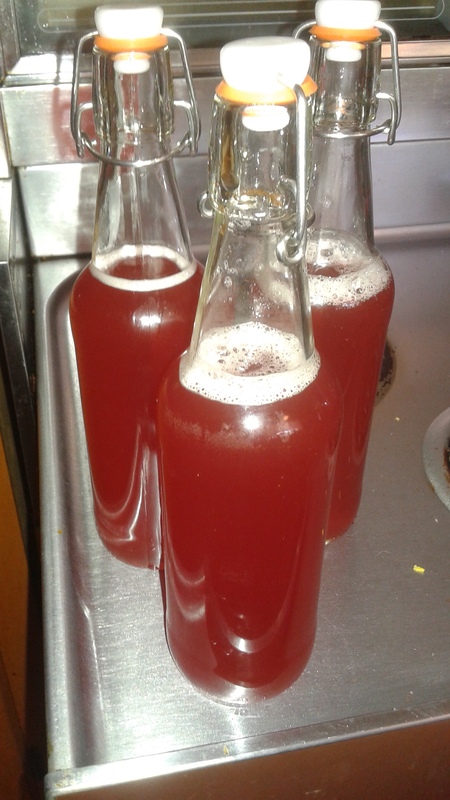 I have the next batch on the counter, this time I will infuse with ginger and raspberry before bottling. If you want to brew kombucha at home I recommend getting a scoby from a friend and looking at thekitchn.com (how to make kombucha tea at home) for instructions. Worked for me. 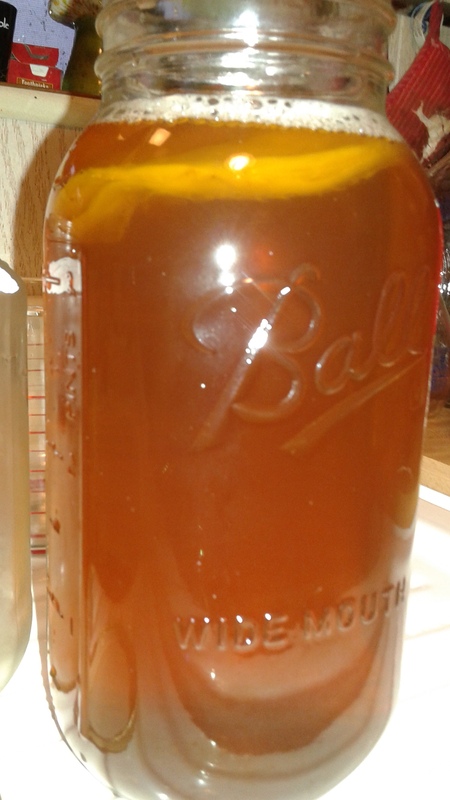 This entry was posted in food and recipes, home brewing and tagged beverage, blog, brewing kombucha at home, fermented tea, home brewing, kombucha, obsession, probiotics, scoby, tea. Bookmark the permalink.